Updated 8-18-2007: Various YouTube video clips from the event are added at the bottom of the post. Today marks the opening of the Portland Streetcar Lowell extension in the South Waterfront district. 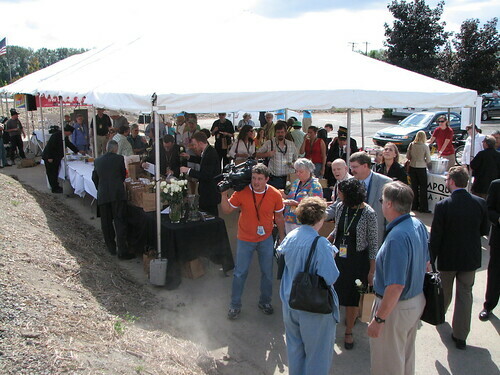 The event was celebrated with live music, a chartered streetcar (or two) for the crowd, food/coffee, and speeches from officials including Oregon Governor Ted Kulongoski. I managed to grab a few photos and an assortment of video clips. 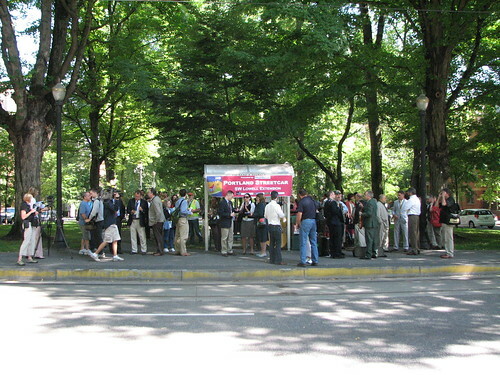 A crowd gathers at the Market St. station in the South Park Blocks awaiting the 1st chartered streetcar to the new Lowell extension. More of the gathering crowd. 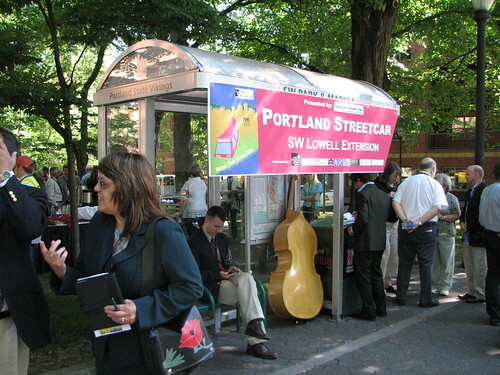 Kay Dannen with Portland Streetcar Inc. helped organize the Portland Streetcar Lowell Extension celebration. The crowd gathers at the Portland Streetcar Lowell Terminus to hear celebratory speeches and live music. 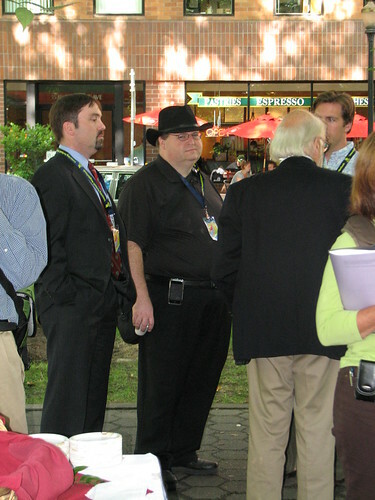 TriMet general manager Fred Hansen (center, facing left) chats with others arriving at the new Portland Streetcar Lowell Terminus. 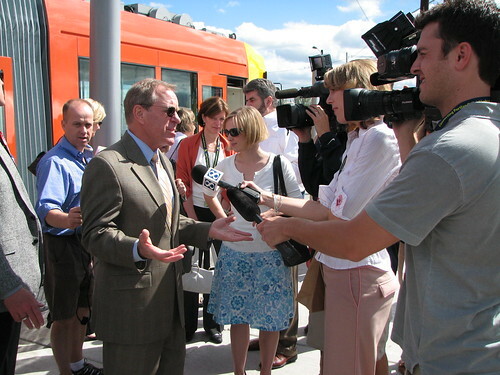 Oregon Governor Ted Kulongoski speaks with reporters after arriving via chartered streetcar — the first "official" trip to Lowell. 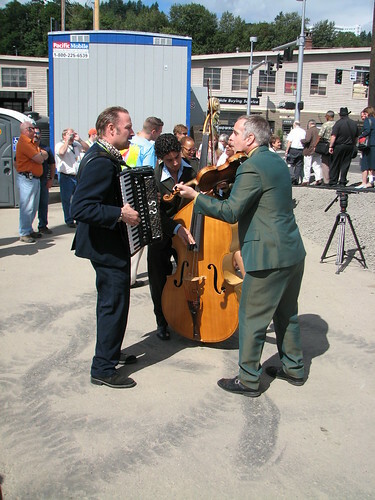 The band "3 leg Torso" performs. More of 3 leg Torso. 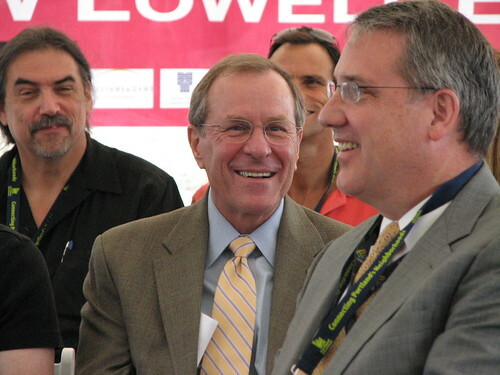 More of Governor Ted Kulongoski at the opening ceremony. 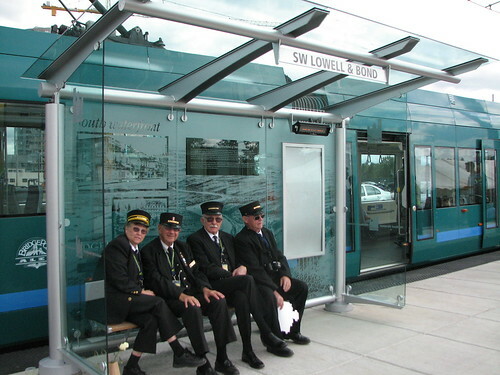 Four motormen (actually one woman and three men) from the Willamette Shore Trolley vintage line take a break from the festivities at the Lowell station of the new Portland Streetcar extension. A streetcar prepares to depart from the Lowell festivities. 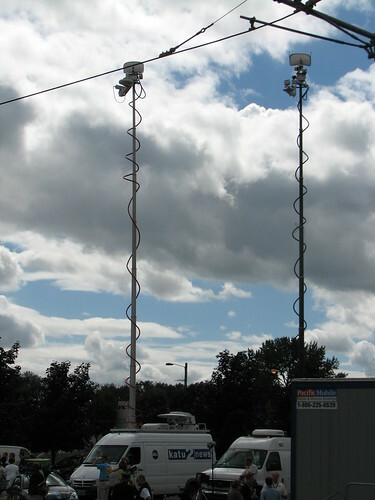 Microwave masts rise like, well Condominiums in the South Waterfront District. 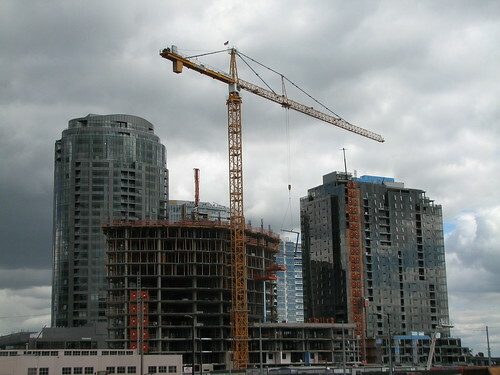 New condo towers rise in the South Waterfront district, as seen from the Lowell terminus of the Portland Streetcar. The arrival (nearly silent) of the first ceremonial charter streetcar to carry celebrants to Lowell. 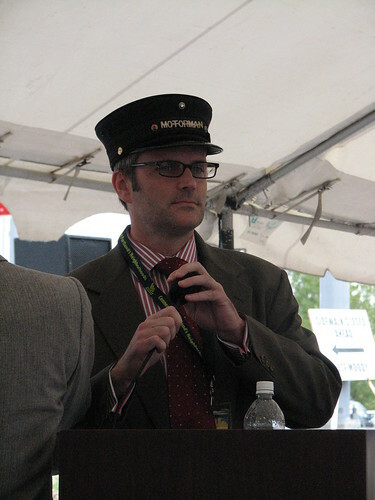 Actual regular service began earlier in the day. Governor Kulongoski’s introductory remarks – This is mainly introductions of other officials, but contains a great moment at the beginning where the Governor chides Sam Adams for wearing a borrowed “Motorman” hat – warning him about the fate of politicians seen wearing hats such as Michael Dukakis. Hmm, looks like the normal noon crowd waiting for a streetcar. Good thing there is a poster advertising the event! Love the photo of the motormen/woman!!! Speaking of hats, Chris, love yer hat. Ted Kulongoski… well, he just looks like money, and like a politician or beauracrat. I suppose that is fitting. 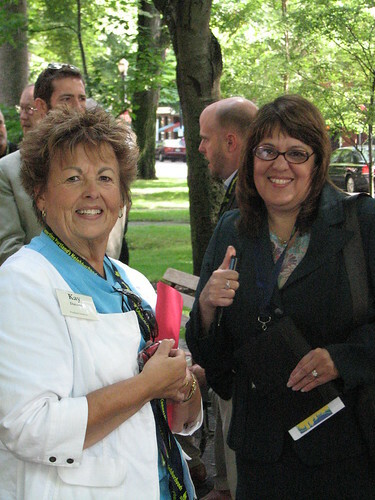 Good to see a picture of Kay Dannen too, now I know who I’ve talked to in the past over the phone per streetcar questions. Now… I just need to take the streetcar to ride the streetcar to Lake O. Curiosity, if the line is extended to Lake O, what will happen to those motormen/women that run the current vehicle? Would they be allowed to run their streetcar on the line still? I mean, it is obviously trackworthy. Maybe a little fixin’ might be needed. I know people who used to go bowling with Gov. Ted and still keep in touch regularly. From what I’ve heard (I haven’t had the chance to chat with him personally), he isn’t a big money politics kind of guy. I’m get the feeling that he is technocratic/bureaucratic in nature, but that happens to be a qualification for the job in my book. 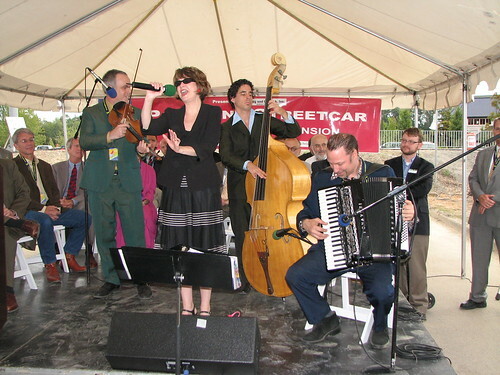 You know, I’m a streetcar fan, but what exactly is being celebrated here? The ‘lowell extension’ doesn’t really go much further than the existing Gibbs stop; more importantly, it doesn’t exactly go anywhere at this time. 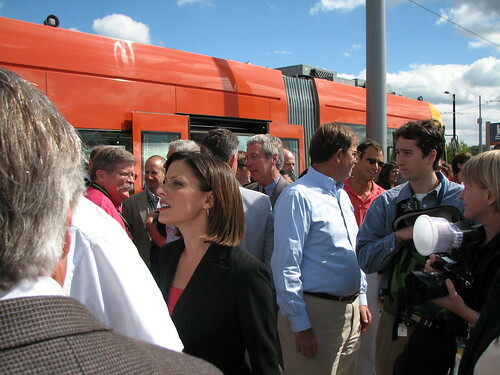 I think the Gibbs stop was worth a celebration – it added the south waterfront as a streetcar destination. The Lowell extension seems underwhelming in comparison. Gibbs brought service to the northern end of South Waterfront (and of course connected to the Tram). Lowell is essentially completion of a loop serving the whole neighborhood. The analogy would be the difference between looping through the whole Pearl District versus turning around at Couch St. 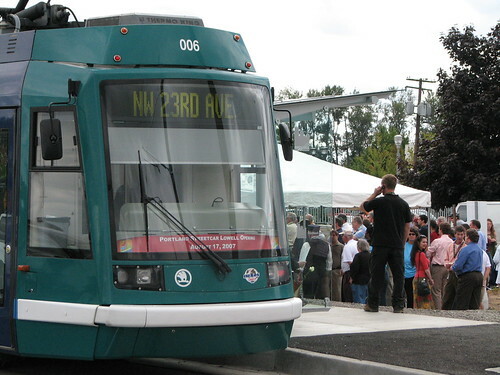 If the “whole neighborhood” is already served by streetcar rail, then why are some folks arguing that Milwaukie Light Rail needs to cross the river and serve South Waterfront? 1) Connecting commuters from the SE part of the region to jobs in SoWa. 2) Connecting what is intended to be another technology employment area near OMSI with OHSU and the technology cluster in SoWa. 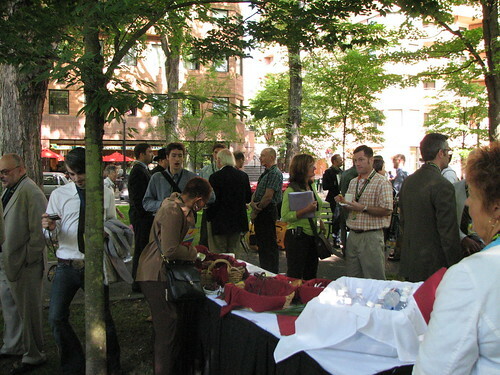 3) [perhaps less important] creating a strong Transit Mall connection to SoWa as alternative to the West End connection that Streetcar creates. As I understand it all the potential LRT connections are still north of Gibbs, so I don’t think they have much bearing on how well the Lowell loop serves the neighborhood. Assuming that the Willamette Shore line gets as far south as the Sellwood Bridge, building an additional 2.6 mile link to Milwaukie would be the least expensive way to do this. I also think the best spot for a bridge is west from the intersection of Holgate Bv. and 99E over to SW Bancroft. This puts a crossing farther away from already well used facilities. On the west end it can also provide an easy connection to I-5. There you have also a connection from the Brooklyn neighborhood to SOWA and to John’s Landing,too. Great for bicyclists. This could be done quite inexpensively by utilizing the lower portion of the Marquam Bridge–connecting Harrisosn St. to the very doorstep of OMSI and also brings it close to PCC.